Patricia “Pat” Kay (Rannow) Becker, 70, of Glencoe, died Sunday, Aug. 30, 2015, at Glencoe Regional Health Services in Glencoe. Urn bearers were Mrs. Becker’s grandchildren, Jordan Gildea, Ashley Becker and Dylan Collins. Interment was in the Glencoe City Cemetery. Patricia “Pat” Kay (Rannow) Becker was born Sept. 17, 1944, in Glencoe, the daughter of Alfred and Mabel (Nelson) Rannow. She was baptized as an infant on Oct. 15, 1944, at St. John’s Evangelical Reformed Church in Biscay, and confirmed in her faith as a youth. She was educated in Glencoe, and was a graduate of the Glencoe High School class of 1962. On June 14, 1963, she was united in marriage to Errol Edwin Becker at Church of Peace in Glencoe. The couple made their home in Glencoe. Their marriage was blessed with three children, Penny, Paul and Pam. They shared over 52 years of marriage. In addition to being a loving wife, mother and homemaker, Mrs. Becker provided day care, worked at the Dairy Queen, cleaned the VFW and the AFC office building, and worked at Starkey Labs for 19 years before retiring. 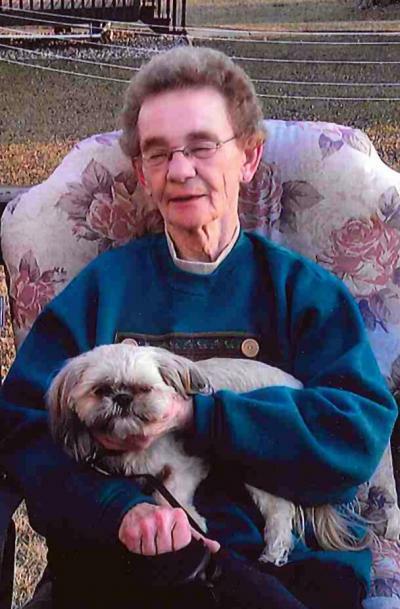 She was a member of Good Shepherd Lutheran Church in Glencoe, where she was a greeter, usher and member of the altar committee. She also was a life member of the Glencoe VFW Auxiliary Post 5102, a member of the Polka A’s of America, and belonged to Snap Fitness. Mrs. Becker as a great jokester and loved to give people grief. She enjoyed cooking, baking canning pickles, freezing corn, shopping, word search, attending garage sales and flea markets, taking walks, polka dancing and spending time on her yard and flowers. She also loved being at the lake and visiting the animals at the sanctuary, especially the goats. She especially cherished the time spent with her family, friends, dogs, grand dogs, grand cats and bird. She is survived by her husband, Errol Becker of Glencoe; children, Penny (Scott) Gildea, Paul (Wanda) Becker and Pam Becker and her fiancé, Ted Collins, all of Glencoe; grandchildren, Jordan Gildea and his fiancée, Brittany Snyder, of Glencoe, Ashley Becker and her fiancé, Dillion Jobe, of Hutchinson, and Dylan Collins of Glencoe; father-in-law, Edwin Becker of Glencoe; sister, Janet (David) Lange of San Angelo, Texas; brothers, Eugene (Marlene) Rannow of Silver Lake, Tom (Nancy) Rannow of Glencoe and Jerry (Peggy) Rannow of Glencoe; sisters-in-law and brothers-in-law, Karen (Willard) Karl of Hutchinson and Eldon (Bev) Becker of New Auburn; nephews, nieces, other relatives and many friends. She was preceded in death by her parents, Alfred and Mabel Rannow; mother-in-law, Dorothy Becker; brother, Dale Rannow; and nephew, Michael Rannow.